Your app has sung “Hello world!” Awesome! And now, customers are signing up. High fives all around—you deserve it. But what now? Getting users to sign up is a big step, but it’s still only the start. Asking them to come back, get engaged, and convert into loyal customers takes more than a killer app. It also takes just the right onboarding flow. Considering the onboarding experience is critical when introducing users to your product. Get it right, and you might nurture the next superfan. Get it wrong, and, well… crickets. Fortunately, all of us already have one of the most effective onboarding tools out there: email. And building onboarding emails aren’t as hard as you might think. What they really take is empathy for your users’ point of view, a clear understanding of the problem your product solves, and a genuine and welcoming “voice” for your brand. Put those together, and you’ll find you have the recipe for success. Here are five effective examples of email onboarding that will inspire you to start writing your own. I’ll tell you why they work and how you can apply them to get your own users on board and engaged. 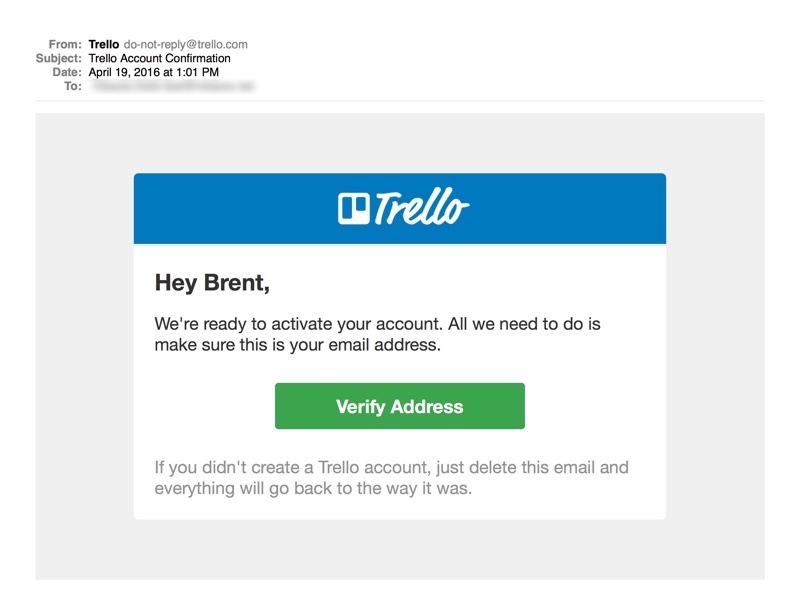 The first email you should send someone who’s just registered for an account is the email verification note. This serves two purposes. First, it’s a key way to verify that the email address the user provided is valid and working. Second, it serves as a confirmation that the user is choosing to sign up for your product (and opt-in for email communication related to your product). Why it works: Starting with a clear and unambiguous subject line, this example gets right to the point and makes it easy for the user to perform the required action. The first name personalization and “If you didn’t…” explanation also reassures the recipient that this is a legitimate email. All the while, it stays true to Trello’s brand voice. Room for improvement: An actual return address would be better than the do-not-reply sender address. Once a user has confirmed an email address, you’ll have a relatively limited window to get her or him engaged. The longer the delay between sign-up and action, the less likely your user is to become an active customer. So, make it easy to get started and reinforce the things that prompted him or her to sign up in the first place. There’s no time like the present to take the first step! Why it works: An eye-catching subject line, clear prompting headline, and easy-to-click button all ensure this email is focused on encouraging a newbie user to give Pinterest a try. 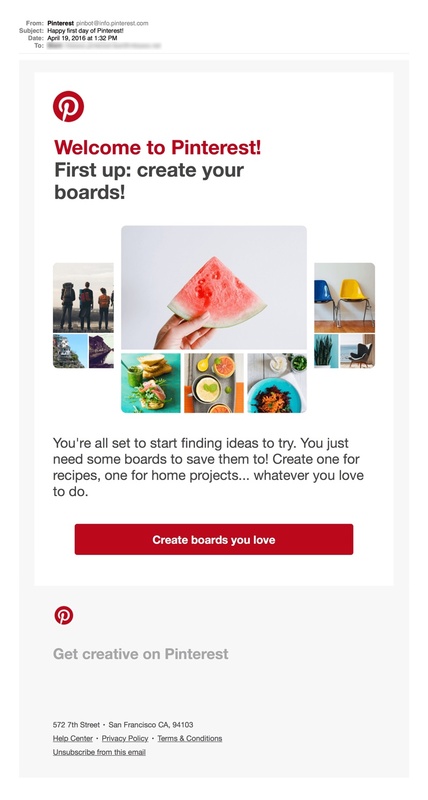 And even if the user puts off taking action, this email strongly reinforces Pinterest’s core brand voice, from subject line through the copywriting and the visual design. Bonus: the [email protected] sending address is smart enough to handle a wide range of possible user replies. Room for improvement: I’d like to see first-name personalization in the copy. That personalization is an important driver of engagement—and something at which Pinterest truly excels. Now that your customer has taken that first step, another key role of onboarding email is to explain how your product works, and what your user should expect. Don’t be tempted to provide a lengthy tutorial! Helping your customer see what to do at a glance goes a long ways toward simplifying the learning curve. Why it works: The visual design and copy—simple to scan, but deceptively substantive—work to keep this message easy to read. At a glance, the user can see how ExpenseIt works… and then dive in if interested. Throughout, key brand messages and the benefits of getting started are communicated. As a bonus, the checkmarks at the top of this email use a psychological incentive called the “endowed progress” effect to help motivate customers through a multi-step goal like getting started using the ExpenseIt app. Finally, [email protected] is a real address that can handle customer responses. No bounces for you! Room for improvement: The subject line, though blandly pleasant, doesn’t create a clear incentive to open the email. It should be tweaked to create a compelling motivation to learn more about using the product. Room for improvement: There are multiple calls-to-action here: shop now, learn more, as well as retailer-specific offers. Let’s zero in on one that’s most compatible with why users joined. Additionally, though the subject line is cheerful, it doesn’t give a clear message of just how easy it is to get started. 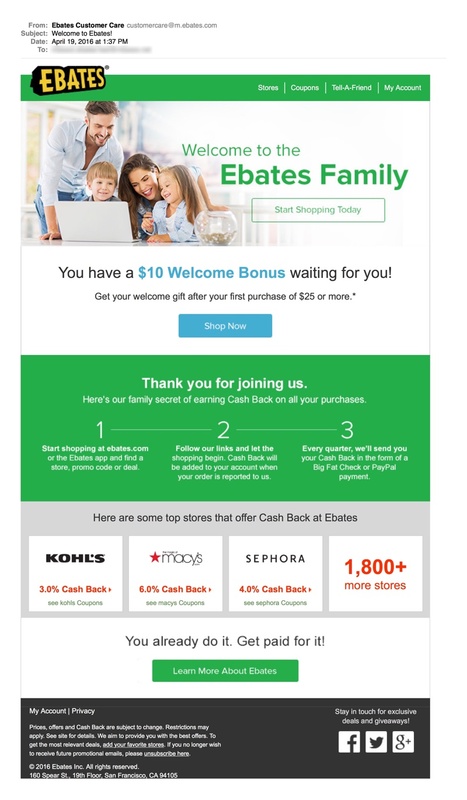 For an action-oriented brand like Ebates, “welcome” isn’t what drives user engagement. Finally, what if a site’s user engagement goal really is just that: to motivate engagement with their user experience and brand? More functionally- or commerce-oriented companies take a very pragmatic point of view when it comes to user engagement: has my customer performed action X or committed to transaction Y? However, content or social networking businesses realize long-term value from attention rather than transaction. For these products, reinforcing the brand and experience of the site is the core goal of onboarding email. Why it works: Medium is all about getting engaged with high-quality content. This new user email skips the marketing-talk and draws a reader into the sorts of long-form writing that’s made Medium a top content destination. It also provides an understated call-to-action to download the app or log into the Medium site in a way that won’t detract from the core reading experience. The content-rich, immersive experience of this email already reflects some of the preferences I established in my initial sign-up: when I registered, I had expressed interest in topics like entrepreneurialism. The personalized content in this first email reinforces the one-to-one nature of what Medium does. Room for improvement: Truth be told, there’s a balance to be struck between personalizing and echoing. As a new user, I’d love to see what else Medium has to offer beyond the specific topics in which I expressed an interest. The subject line, though superficially personalized, doesn’t tell me what to expect from this email—there are better ways to draw the user in! Perhaps most importantly, this email doesn’t make a direct mention of how a new user can like, comment on, and create new Medium posts—that’s a missed opportunity for this onboarding email, because interactivity is key part of social networks like Medium. Finally, this particular example exhibits the bugaboo of a “noreply” sending address. Email is a two-way communication medium. Be sure your approach to email onboarding doesn’t leave a user without a means to communicate. 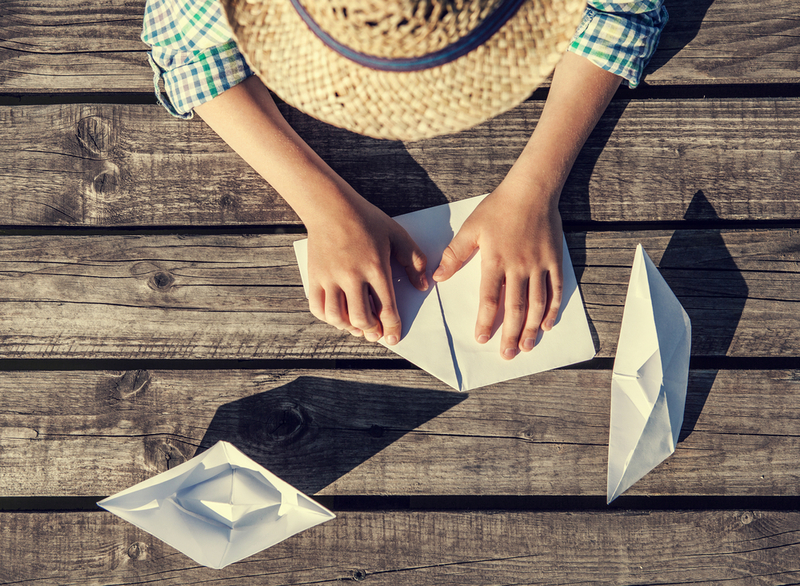 Are You Ready to Get Started with Onboarding Email? Combined with in-app prompts, UX cues, and psychological incentives like gamification, email is a highly effective piece of the onboarding flow. These five examples show how you can use it at each step of the user engagement process. I hope you’ve found these tips helpful for developing your own user onboarding strategy. By the way, do you have a great example of onboarding email to share? I’d love to see it!